The newly designed Model450 DX combines the chopping benefits of Sweed's previous Model 450 WM and Model 450 WM XHD into one unit. 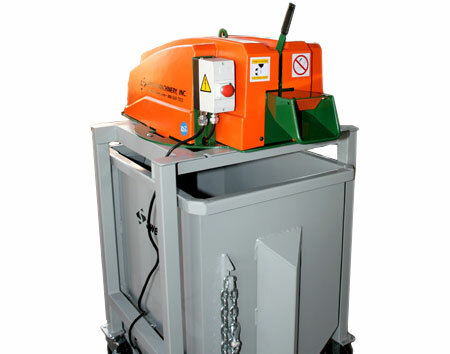 It is the preferred scrap chopper to tackle high volumes of W steel banding with clips, plastic banding, light weight wire and other various manufacturing materials. It is also very versatile, making it an excellent chopper for in-line placement to process slitter-line trim and tube scarf scrap. It features a wide in feed, which allows for easy operator feeding of scrap material and the additional horsepower and external flywheel provides extra cutting capacity for tougher materials. This chopper sits on a sturdy Sweed stand that moves from area to area on stout caster wheels. Both the stand and hopper are sold separately. Choppers are the ideal way for companies to meet their waste recycling obligations and reduce their disposal fees while adding re-sale value to their waste product. Additional benefits of a scrap chopper include reclaiming space for production and aiding in safety and housekeeping, ultimately, resulting in a better working environment.